Boxed and performance type arms keep everything lined up nicely. Wheel hop is the tire going up and down which is controlled by the shocks. I used to go through shocks all the time. I knew they were bad ( not heavy duty enough) when I got wheel hop. Look into some heavy duty shocks. OK, thanks. I guess my 15 year old Monroe sesatracs aren't cutting it. I love the new stance, it looks great. Hawk03 wrote: I love the new stance, it looks great. thanks, it has been high in the rear since the mid '90's so it was time for a change. I bought some Metco lower arms with adj. uppers, the lower arms also had a thingy to lower the mounting point of the lower control arms in the rear. Using those and changing the pinion angle a few degrees with upper barsreally helped the car to hook and eliminated any wheel hop issues They are called instant center brackets here is the website. No, The car was setup for drag racing, the metco control arms require an aftermarket sway bar. They mount to the side of the control arms, not on the bottom. Bruisr wrote: No, The car was setup for drag racing, the metco control arms require an aftermarket sway bar. They mount to the side of the control arms, not on the bottom. I will mention the ones I got (PMT fabrication) required the sway bar (95 impala SS) be shimmed down a little to clear the rear bushing. Other than that they fit and look awesome. Is that a pic of your car above Limey? Bruisr wrote: Is that a pic of your car above Limey? There are a few members here who've gone w/ the Spohn products can't recall anyone that's installed the Hotchkis. If all you are wanting is the boxed arms Why not Just box the stock ones in and getting a Impalla / Carprice sway bar for the added beef ....... There is a member here that Boxes the stock lower / upper ones But he is Process of Moving outta state SOUTHBOUND and maybe before he jumps ship he could get a set done for you ? Setting the pinion angle isn't difficult when you adjustable upper control arms. The plane of the pinion needs to be in the same plane as the transmission, namely the output shaft. Using an angle indicator, like they sell at Home Depot etc, for carpenters, the angle of the trans can be located from the bottom of the pan rail, and the pinion angle can be measured from the face of the pinion flange, with the drive shaft removed. plus + or minus -- 1 degree difference seems to be considered close enough. There is good info on this on Inland Empire Drive line Service's site. I read that changing the pinion angle 1-2 degrees down aids traction tremendously. Unfortunately, when I did mine, it was as I installed the new upper and lower arms, the instant center relocation bracket, and poly bushings, with KYB shocks, so I don't know if the pinion angle alone made the biggest difference. I will use the exact same setup on my chevelle, when the time comes to start that project. maybe its a stupid question but is it possible to boxed them yourself by welding it? You can do that. I heard you can buy the boxing plates for a earlier car and they fit ours. That's what the factory did it. Thanks for the reply dyncel! Does it make a big difference when they are boxed or is it for cars with allot more horse power then mine? And is there a difference if you buy them or make your own ? Sorry for al my guestions i am a big noob in this kind of upgrades. dutch wagon wrote: maybe its a stupid question but is it possible to boxed them yourself by welding it? 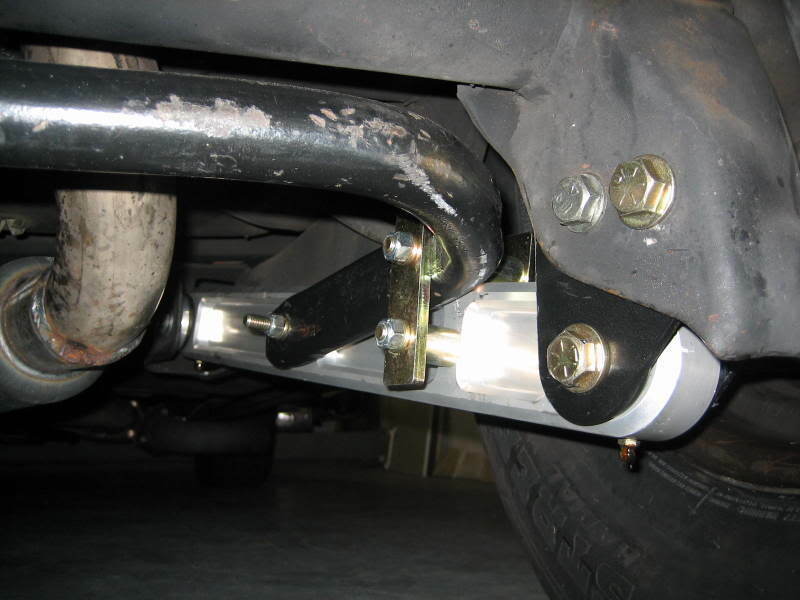 You would probably get better results by just adding a(factory style) rear sway bar. The way it installs somewhat boxes the arms, but the bar really improves handling and stops that side to side "walk" over speed bumps that our cars sometimes have. And i would like to see a pic of your control arms. A saw on the spohn site a kit for new polyurethane boushings will ad those also to the list.